Everyone loves a little classic noir story. But when you put a new twist on a classic genre, you know you’re in for a fun night. In the highly immersive Clown Bar by Adam Szymkowicz featuring music by Adam Overett, you placed right into the action of a noir style murder mystery. However the clever spin in this story is the characters happen to all be clowns. When detective Happy, a former clown himself, searches for answers about the murder of his brother Timmy, a rising clown, we see the whacky clown inhabitants prowling the bar, all of whom turn into suspects. On Happy’s journey, we meet a cast of characters including silver-toned emcee Dusty, foul-mouthed Petunia, former flame and burlesque dancer Blinky, and the head honcho Bobo. Through flashbacks and murder “in clown blood”, Happy gets the answer he’s been yearning for all while getting a taste of his past. What Clown Bar does beautifully is brings the immersive experience to the max from start to finish. Upon entry and receiving your own red nose, the show is already underway. From clowns sitting at the bar drinking to the adorable “shots girl” Brian, played by Michael Lorz, selling clown-themed shots and offering a whoopee cushion for a social media picture with your red nose, the life of the party is ever-present. Dusty serenades with Thumbs, played by musical director Ian Axness, on the keys all while the audience sips on clown themed beverages. Once the show gets underway, the action comes to life all around you. While the plot is nothing new, the clever clown twists and Szymkowicz witty script is what keeps the night lively. As the detective with a past, Shane Zeigler shines as Happy. Zeigler is perfection for the noir style of the character. From body language to vocal inflection, Zeigler shined. Dan Tracy as Timmy was superb with his mix of humor and pain. Tracy’s characterization was captivating through the flashback scenes. Jessica Frey and Salty Brine as the main entertainers Petunia and Dusty respectively were truly the heart and soul of the production. Frey’s Petunia was always the source of cheap laughs while Brine’s Dusty had a wonderful report with the audience. Director Andrew Neisler did a great job tackling the tough terrain of the space. But thankfully The Box was a wonderful location for the play. The speakeasy style ambiance was perfection. Neisler discovered the balance of dark and humorous within Szymkowicz’s script. While the tight central space allowed for some unfortunate sight line issues for certain audience members, expanding the stage to fill the entire bar was a nice touch. Costume designer Meghan Gaber found each actor’s personality through their clown costume. With iconic clown attire, Gaber still evoked the noir vibe of the world. Joe Cantalupo’s lighting design was top notch for the venue, bringing in the dark and smokey aura alongside the presentational moments. 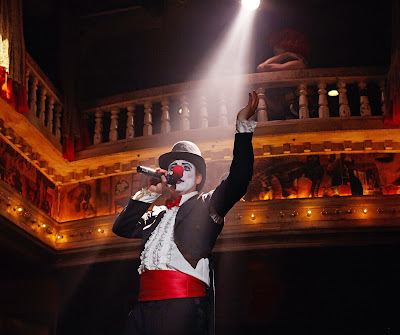 Clown Bar is a top notch immersive event that is unique and bound to be a cult favorite. Don’t let the steep food and drink prices scare you away from truly enjoying the evening. “Clown Noir” is sure to be the next hit genre of entertainment.